We're getting near the end of our summer themed days now. They will definitely be resurrected during the holidays, but when Harry starts school we sadly won't have the time during the week. They have been a lot of fun, and it's been really good to have a list of activities planned for the day, although it does mean that Harry is now constantly asking what the next activity is going to be and isn't happy when I tell him it's time for him to amuse himself! Under the Sea was a very versatile topic, covering not only marine life but also venturing into the realms of mermaids and pirates. I decorated the table with blue towels, my felt fish and various sea life related toys and jigsaws. Our first activity was making a themed Under the Sea Cake. 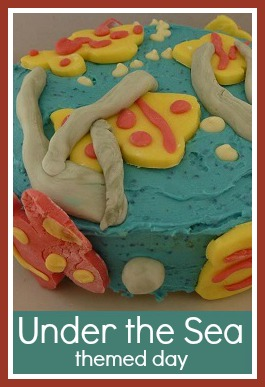 I've blogged about this one already - our Under the Sea sponge cake. We had lots of fun making this. Then I kept the mixer out and we made some salt dough to turn into Pirate or Mermaid Treasure. My simple salt dough recipe is 1 cup salt, 2 cups flour and 1 cup water then baked in the oven until firm. We just cut out small circles, then Harry used some coins to press into them to make patterns and indentations. We first painted them with poster paint, unfortunately we didn't have a lot of yellow left so we mixed in brown and orange. Then when they were dry we finished them off with a coat of golden glitter paint. I've not seen them since we made them, they've been spirited off and hidden somewhere. 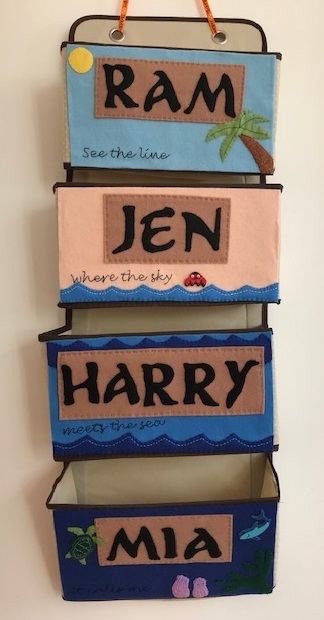 You can read more detailed instructions here to see how we made them. We are really into Hama beads at the moment, so I made up some simple Hama Bead Fish templates for Harry to copy, plus a more complicated angel fish for myself. I've included the patterns below, they are all made on a small hexagonal base. I've seen paper plate aquariums all over Pinterest and so I don't know exactly where to credit the idea, but I thought that a Hama Bead Paper Plate Aquarium would be a great home for our Hama bead fish. You just need two paper plates, cut a hole in one, paint them and then staple them back to back with the fish hanging from cotton inside. Harry also cut out some weeds from green paper to stick at the back. I was really pleased with this craft, although the fish wouldn't play along for a nice photograph! Then we made some Mermaid Gardens. I gave each child a large plant pot tray to fill with sand, then gave them some clear glass pebbles, star sequins and little shells, as well as encouraging them to look around the garden for things to decorate the garden with. Mia had fun hiding the pebbles in the sand, but Harry was really involved in putting together his garden. Then he developed it into some small world play, coming up with a really detailed story about a plant that the mermaids were trying to grow, but it died in winter and they had to plant more seeds (sequins). It was fascinating to see where his imagination took him. You can see pictures of our mermaid gardens over on the Twinkl blog. Finally I turned to Twinkl for some quieter activities for Harry. He's really into cutting out at the moment so he enjoyed these fish size ordering worksheets (Twinkl subscriber resource) and these fish colouring pages (free download). I'm also a fan of these pencil control worksheets (Twinkl subscriber resource) and complete the pattern worksheets (Twinkl subscriber resource).